Exhibit: "What Big Eyes You Have! Looking at the Wolf in Fairy Tales"
UNIVERSITY PARK, Pa. — Portrayed as big, bad and ravenous, the wolf in fairy tales is most often the villain, a beast who tricks and then devours both children and adults before meeting a violent end. A new Penn State University Libraries exhibition, “What Big Eyes You Have! Looking at the Wolf in Fairy Tales,” opening Tuesday, Jan. 16, in Penn State University Libraries’ Eberly Family Special Collections Library, takes a close look at historical depictions of the wolf in well-known and lesser-known fairy tales, drawing from several sources among Special Collections Library materials. Highlights of the exhibition include early illustrated editions of fairy tales — especially those collected by Charles Perrault and the Grimm Brothers — as well as unusual and visually engaging pop-up, shaped and artists’ books. 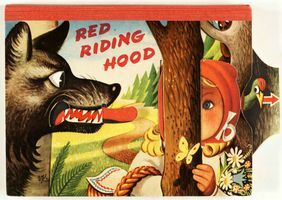 The variety of books on view, from “Little Red Riding Hood” and “The Three Little Pigs” to lesser-known titles, such as “The Wolf and the Seven Young Kids,” offer a trove of rich imagery for asking what the wolf symbolizes and what our complicated relationship with wolves — both real and imaginary — reveals about our own human nature. The exhibition “What Big Eyes You Have! Looking at the Wolf in Fairy Tales” asks visitors to consider what the wolf symbolizes and what our complicated relationship with wolves — both real and imaginary — reveals about our own human nature. “Wolves and their motivations can be interpreted in a myriad of ways depending on who is doing the looking,” Clara Drummond, Special Collections Library curator and exhibitions coordinator, said. “The wolves on view range in their appearance, from dog-like and wolf-like to human-like, and express various states of mind, from menacing to friendly. Looking closely at their appearance on the page adds to our understanding of the moral lessons of the tales.” Visitors to the exhibition also will be able to view the award-winning 2012 short documentary “Wolf Mountain,” which tells the story of Tonya Littlewolf and the pack of rescued wolves she cares for. The film offers a more nuanced portrait of the wolf than one commonly presented in European fairy tales and provides insight into the plight of real wolves in the United States. The 2018 Charles W. Mann Jr. Lecture in the Book Arts is scheduled for March 22 in Foster Auditorium, 103 Paterno Library, and will feature an invited speaker whose research relates to the exhibit. The Mann Lecture, named in honor of Charles W. Mann Jr., the first Dorothy Foehr Huck Chair for Special Collections in the University Libraries, is an annual event featuring scholars with academic research areas connected to the materials held in the Eberly Family Special Collections Library. It is supported by the Mary Louise Krumrine Endowment. Additional details about the 2018 Mann Lecture are forthcoming. “What Big Eyes You Have! Looking at the Wolf in Fairy Tales” is scheduled for display through Sunday, May 13, in the Eberly Family Special Collections Library Exhibition Room, 104 Paterno Library, on Penn State’s University Park campus. For more information about the exhibition, contact Clara Drummond at cjd86@psu.edu.